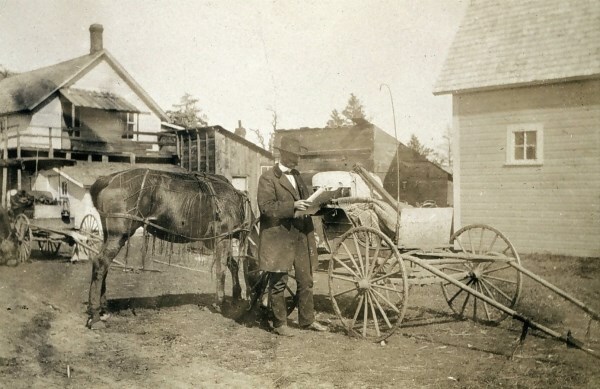 Surveyor Jasper Sherman Bilby on assignment in Minnesota, 1903. Courtesy of NOAA. Indiana’s history is rich with inventors and pioneers. Philo T. Farnsworth, who lived in Fort Wayne for over a decade, invented the television and designed an early model of a fusion reactor. Elwood Haynes, Kokomo native and scientific prodigy, designed and assembled one of the first horseless carriages in the United States. Another Hoosier whose scientific mind for innovation proved indispensable to the nation was Jasper Sherman Bilby. His steel surveying tower radically reshaped the accuracy of map making and left a permanent mark on the way we view the United States. Jasper Sherman Bilby (known as “J.S.”) was born in Rush County, Indiana on July 16, 1864 to Jasper N. Bilby and Margaret E. (Hazard) Bilby. Bilby’s early life has a rather tragic side; his father committed suicide in 1877 after being arrested for the sexual assault of one of his daughters. This hardship forced Bilby to leave school and to work on the family farm for a number of years in Fayette County to support his widowed mother. 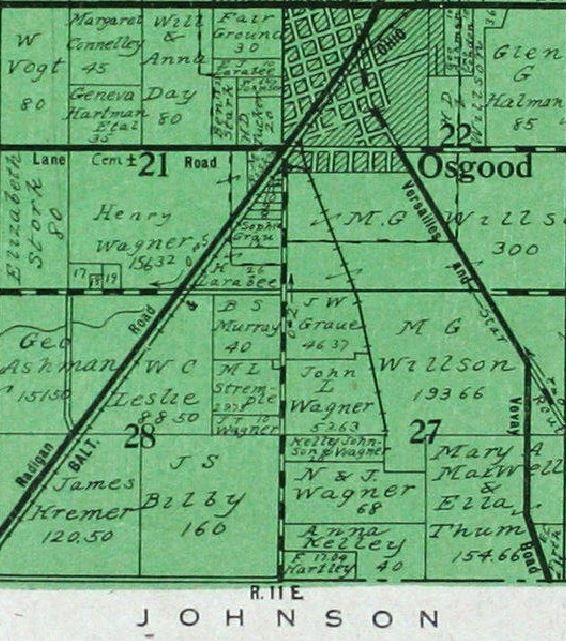 After his marriage to Luella Cox in 1891, Bilby moved to Ripley County as early as 1893, according to Ripley County deed index books. Plat book image of the Bilby Homestead near Osgood, Ripley County, 1921. Courtesy of Ball State University. Bilby joined the United States Coast & Geodetic Survey in September of 1884. Congress established this agency, originally called the United States Survey of the Coast, on February 10, 1807. Initially under the purview of the Treasury Department, the survey was reorganized under the US Department of Commerce in 1878 and renamed the United States Coast & Geodetic Survey (US C&GS). Today, it is under the umbrella of the National Oceanic and Atmospheric Administration (NOAA) and called the National Geodetic Survey (NGS). Bilby conducted his first survey work in Illinois along the 39th parallel. According to surveyor Raymond Stanton Patton, the 39th parallel was a line of latitude that spanned from Cape May, New Jersey to Point Area, California, and was the “first great piece of geodetic work accomplished by the Survey….” His official position within the US C&GS for most of his career was that of “signalman.” A signalman uses flags or signal lights to indicate points within a geometric calculation between two survey points, usually between a point on shore and a point within a body of water. This practice ensures that those making the calculations on shore accurately represent the point in water. 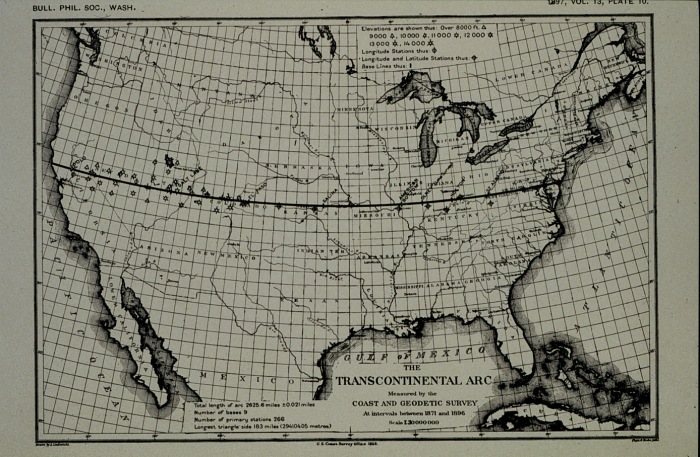 A map of the 39th parallel arc. According to NOAA, it served as the “first great geodetic arc in the western hemisphere .” Courtesy of NOAA. Bilby traveled 511,400 miles during his 53 years in the US C&GS, from Illinois to California, according to his career field reports. Newspapers throughout the country recorded his cross-country traveling for the US C&GS, notably his work in states like Louisiana and Texas. Department of Commerce publications also chronicle his time in Wisconsin, Illinois, and Georgia, detailing his work in specific counties. In 1920, Bilby and his team surveyed the majority of Wisconsin and Illinois, providing exact coordinates for most regions adjacent to water. In these surveys, Bilby used the Traverse method of surveying, which is less accurate but quicker to calculate than Triangulation. (The traverse method uses pointed lines for measurements while triangulation uses angular measurements based on triangles.) Bilby and his team completed surveys within the Rio Grande valley in 1917, specifically from Harlington to Dryden. His efforts in the eastern area of the Rio Grande ensured more accurate measurements, adding to the US C&GS’s triangulation of the American west. Especially…when the wind is howling through the trees, and the rain is pattering down on the tent, and you know there’s little change of anyone dropping by. An artistic depiction of a wooden survey tower, in the July 1926 issue of Popular Mechanics. Courtesy of Google Books. Radio has made the coast and geodetic survey known more than it used to be. A few years ago people were always asking what the name meant, but now I often find they know us pretty well, from talks they’ve heard on the air. One lecture on mountain building which was broadcast from Washington was the means of getting me a fine dinner. I had stopped at a farmhouse to make inquiries and the farmer noticed my ‘geodetic’ tag. He mentioned this talk he’d heard, and when I said it must have been given by the chief of my division, Major Bowie, he became so interested that he made me stay to dinner and answer his questions. However, that wasn’t unwelcome after eating my own cooking for so long. 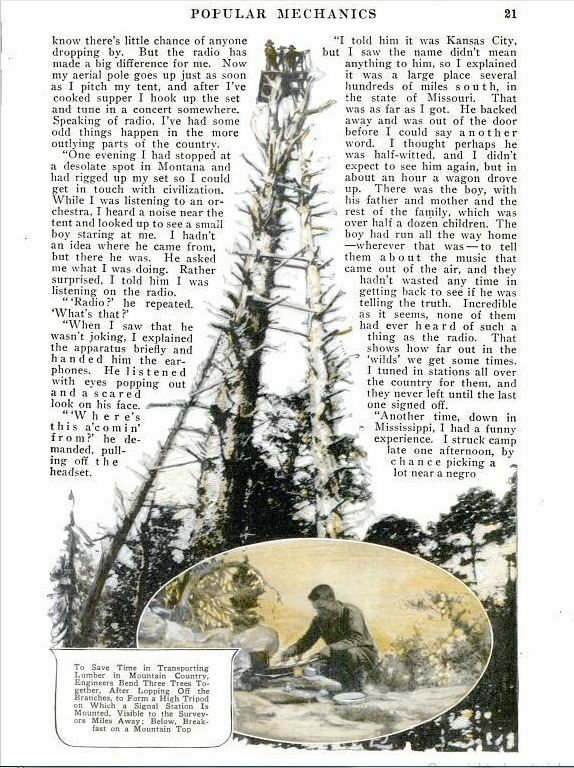 This story was published a year before the first usage of the Bilby Steel Tower, when wooden towers were still standard equipment. His early years as a geodetic surveyor, particularly his negative experiences with wooden survey towers, would influence his greatest contribution to the field: the invention of the Bilby Steel Tower. Bilby’s influential invention, the Bilby Steel Tower, will be covered in Part II.